What a perfect name! And, a perfect mane! We have a rescue cat also,I shall get busy with my camera. What a beautiful kitty. 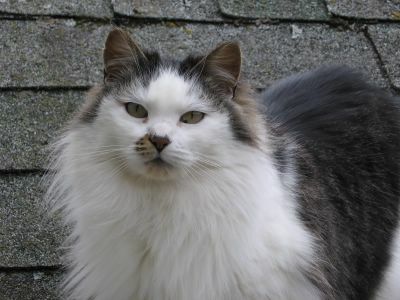 I dearly love long haired cats. If I didn't live in the city, I would have more cats! Yes, along with everyone else--I thinks she's beautiful. I love when a cat has unusual marks like that on their face. Oh! Smudge? That was the name of the cat my mom had when she was a teen. Your Smudge sure is pretty. Seriously, I commented this on one of your other posts, but he really looks like my Charles. Right down to a smudge of color by his nose, only Charles's is one the other side.